If you’re a proud owner of a VR headset, you must already be amazed by the opportunities it offers, as well as by innovative new applications and games that are being released daily. VR environment gives you something unlike any other platform out there. You are put in a virtual 3D environment and free to do whatever you like. It is no wonder then that there are VR games putting you in a position of a deity, with godlike powers at your discretion. The feeling of power you get while playing such a VR game cannot be compared to any other game on any other platform. Craving a daily dose of power trip, we dug deep, far and wide to find only the best of these. So, without further ado, here are top 5 godlike VR games. First on our list is a PSVR title that puts an interesting little twist on a classical city building game. 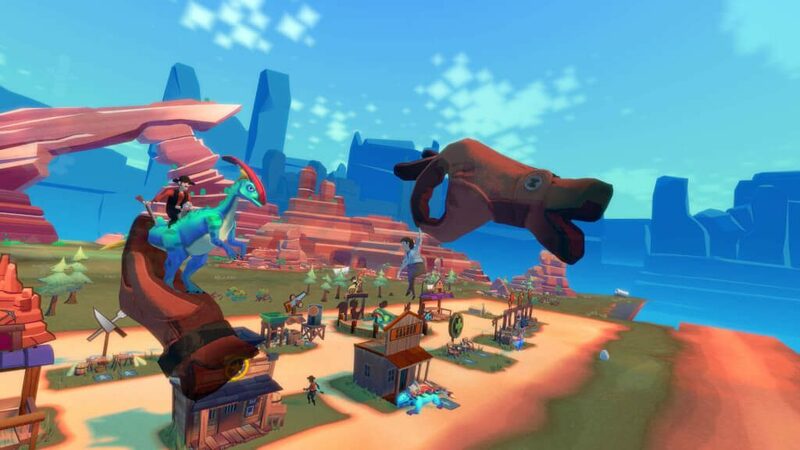 You are in charge of a small town on the outskirts of the wild west with some unusual neighbors in the form of dinosaurs! Well, who would have thought of combining cowboys and dinos, but it sure works and is a helluva fun! The objective in this game is to grow your town, develop buildings, maintain the economy, all the usual town building stuff. The best part is capturing and taming dinos who will make a valuable addition to your town’s population. Some of them are very useful for the economy and infrastructure. They water the crops, help you harvest resources, while others, like the apex predator T-rex, are useful for protection. The predators are especially important when your arch nemesis in this game, the Bandit King, decides to stroll down the valley and with his own army of dino minions to loot and pillage treasures you have meticulously obtained. The game is very hands-on in its approach. It is recommended that you do most of the management since that will be the best way to ensure your victory. However, other than the feeling of growing your own little personal town, there aren’t that many powers giving you the feeling of the omnipotent being. The other downside to this game is its short duration and the lack of replayability. 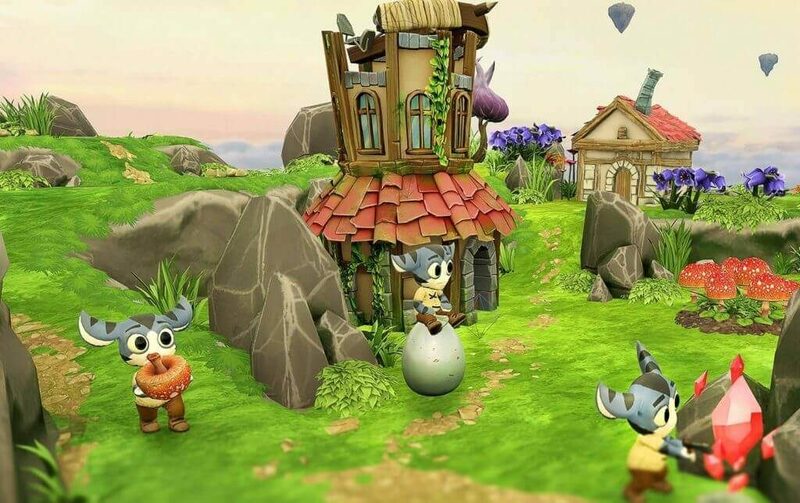 After you have defeated the bandit king and tamed all the dinosaurs, there is really no incentive for you to continue playing, which is a shame since the game is very well polished and very engrossing. One thing’s for sure – seeing those little dinosaurs grow makes my heart warm. Here comes another title for PSVR, also released for HTC Vive and Oculus Rift about a year ago. Tethered is a game that provides a bit more of that awesome omnipotent feeling in this resource management game. You are put in the boots of the benevolent being who has an island to manage with the help of little creature called “Peeps”. They literally fall from the sky in the form of an egg. You, as their supreme leader, are in charge of issuing them various tasks, such as collecting and mining resources and building structures. The main objective is to collect Spirit Energy which can be done in various ways. You can collect crystal which is the condensed form of said energy. You can also kill critters that come at night trying to whack your little Peeps and steal your resources. You didn’t think it would be that easy, did you? The name of this fun little game comes from its mechanics. You assign your Peep to do your bidding by tethering him to a certain task or structure. Tethering is also done when you usher your godlike powers and renew certain resources by tethering a cloud of magical energy which replenishes some of it. Although the game looks simple and the premise is pretty straightforward, if you do not keep tabs on your little minions, things could get out of hand. Peeps can easily starve or get decimated by the critters spawning at night, which can easily push the remaining ones to go into frenzy and they start jumping off the island, straight into the bottomless pit of their demise. Now, that would be very irresponsible for a supreme being, wouldn’t it? After you have collected sufficient amounts of Spirit Energy, the level is completed and you are sent to the next island. There are 13 islands in total, where you mostly do the same stuff, so the variety is a bit lacking. Other than that, the game is quite polished, with beautiful graphics and nice background music featuring Celtic overtones. Here is a game which truly simulates the feeling of godlike powers. The start of the game is simply engrossing. You begin in the endless space and you are free to grow your world as you see fit. Put different tiles on the map, grow your world and it will adjust accordingly. Make lakes, marshes, forests, mountains. Cultivate the land space to your heart’s desire. Of course, what kind of a god would you be without the people to believe in you? Do not fret, for you are provided with the humans who will do just that. If you take care of your followers by protecting them from fires and helping them build a civilization, you will be revered and worshiped properly. Unfortunately, there will be some pesky heretics along the way. Now, why would you tolerate such insubordination in your world? My thoughts exactly. If you ask me, grab the nonbelievers and throw them into the endless abyss. Or simply smash them into the ground. There will be no heretics on your watch. 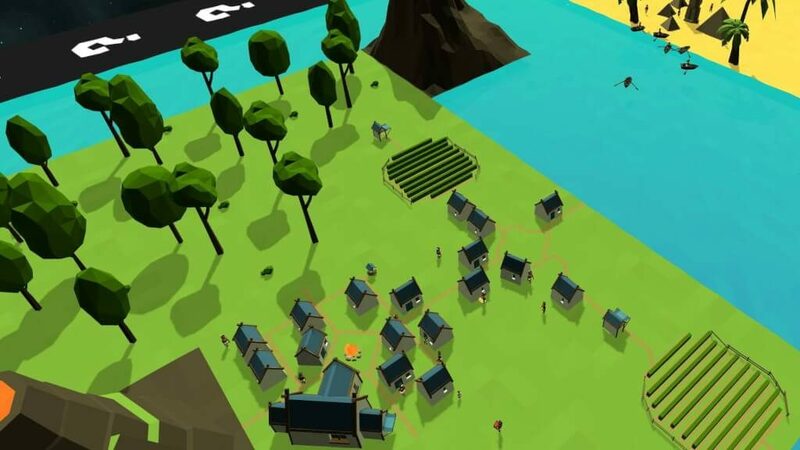 Deisim combines the civilization management mechanics with the feeling of total omnipotence. This is emphasized by the fact that, when placed in the world of VR, you’re given much more freedom in controlling your environment, and you truly have a hands-on approach. You can move mountains, stroll around the earth and raise fires, or you can take a more laid-back approach and watch as your followers grow in population and technology. The game really gives you the freedom to do as you see fit. As the title suggests, you are a god and there is an island which requires your attention. Do not worry, you won’t be doing most of the grunt work. Humans that worship you are there for a reason, but use their help wisely. 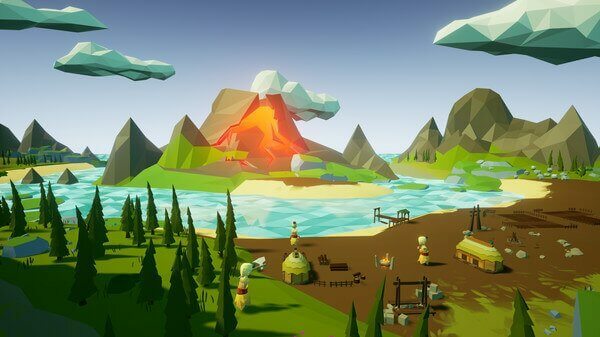 Super Island God VR is more of a civilization management and city building game, although you are given certain powers such as replenishing forests and sending fireballs or rain. Whatever you prefer more. Hopefully, you will use your powers wisely, since the objective of the game is to complete certain challenges per island. If you destroy everything you are kinda shooting yourself in the foot. It’s still fun wrecking everything though. See that volcano over there? Someone is gonna visit it…upclose. The downside of the game is that it really feels more like a management game than a true god game. Your powers are limited and you do not have absolute control such as you do in Deisim. Basically, you are a demigod. Other than that, you should really pay attention to resource consumption and building placements. The space is limited and you might end up exhausting certain resource which will make you restart the game. Not only that, but there are certain limitations and dangers which you have to be mindful about too. For example, if you don’t provide a proper sacrifice to a volcano god, expect molten hot lava to wreck everything you’ve been working on. You’re not the only deity on the island. All things taken into consideration, it is a very cool godlike city management game filled with lots of Easter eggs for you to discover. Your powers are certainly lacking and could be increased a bit, but it won’t stop you from having fun with it. Evolution VR is a Vive exclusive that puts new perspective and challenges in the life of a godlike being. It’s a spiritual successor of the game Spore, which puts you in charge of an organism as you guide it through the process of evolution. Everything happens underwater though. 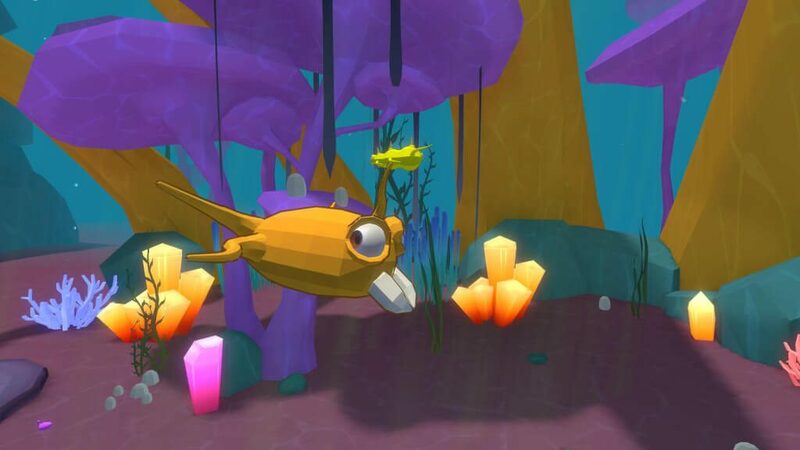 Customize your little creature and guide it into the deep reaches of the sea. You will have to eat other creatures to collect DNA material. This will help you evolve in later stages, as well as avoid the nasty predators lurking below the surface. The mission, of course, is to stay at the top of the food chain. To achieve that, you will have to carefully choose the evolution path to beat all the other fishes as you fight for the same resources. The game presents its challenges in every stage. There will always be new body parts to unlock and intimidating creatures to fight. It’s a real shame that the game doesn’t last that long and goes beyond the stages of evolution after the underwater part. In this list we have brought you five games, each covering the different aspects of godlike powers and tasks. Hopefully, you will find a game that best suits your affinity. The world of VR is designed for games like this, and there are many more new opportunities for developing such games. We can’t wait for more great games in this genre. And you?